Alberta, a western province of Canada, has an estimated population of 4,067,000. Alberta’s capital, Edmonton, is the primary supply and service hub for Canada’s crude oil, the Athabasca oil sands and other northern resource industries. Such a populous area which has a heavy impact on the economy will have a need for commercial and residential security services. Let Optimum Security protect your home or business in the province of Alberta. Our professionally trained guards will stand ready to protect your property. 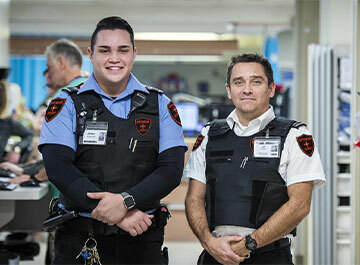 We also have a close relationship with Alberta law enforcement personnel to ensure our clients receive superior security services at all times. Optimum Security’s guards are highly trained and will protect your property at night or any time you are away from your property. We offer mobile patrol security teams or you can choose to have a uniformed security guard at your property 24 hours a day, seven days per week. Our guards maintain a visible presence in order to discourage criminal activity around your property. You can rest assured knowing your property is being monitored using video surveillance and patrols at regular intervals. You can choose to protect your home or business with security and alarm systems that we offer. Our systems will reliably alert you to a home invasion. Additionally, our systems can also alert you to other dangers such as fire and smoke, carbon monoxide danger, water and flood damage and extreme changes in temperature. You are constantly connected to our Alberta monitoring team so emergency situations receive immediate attention. Client satisfaction remains Optimum Security’s number one priority. Whether you’re a homeowner or business owner who requires protection of your property, you can depend on our company to provide you with the security services you need. With the growing population and economy of the province of Alberta, there’s a good chance you will need to increase security measures. Give us a call today so we can personalize your options and provide security services that fit your needs.